Happy New Year! 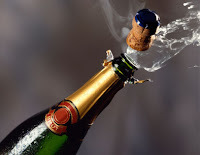 My final post for 2011 includes drinks and film clips to help you celebrate! 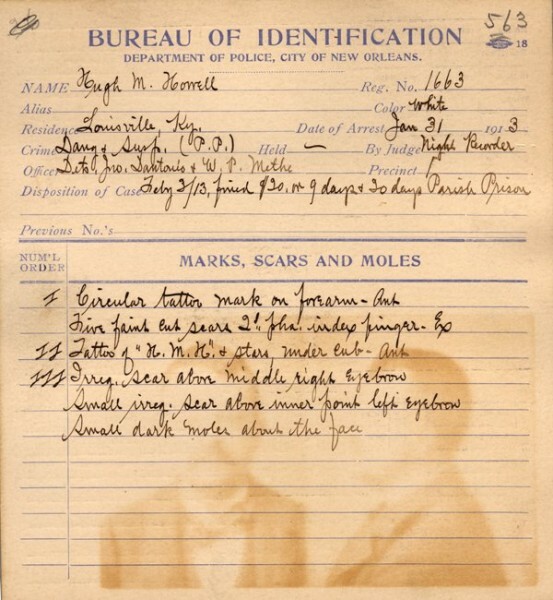 Last May I blogged about Detectives and their Drinks. In June I posted about James Bond's Vesper Martini. Detective team Nick and Nora Charles always come up on top for detectives with a pension for drink. The constant drinking of this bantering couple never hampers their investigative skills - quite the opposite. 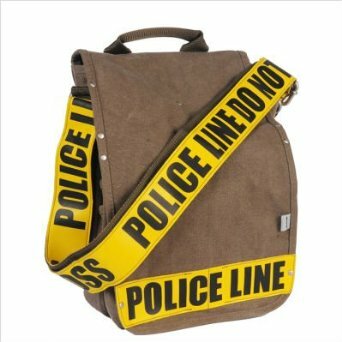 "Can't you say anything about the case?" a detective asks. "Yes," Nick grumbles. "It's putting me way behind in my drinking." What will you be drinking tonight? Pick Your Poison and Toast 2012! Enjoy! If you follow this blog--or if you know me--you know that I'm a list maker. So I was putting together a list of different chocolatiers who make champagne truffles for a New Year's Eve post on DyingforChocolate.com, and I thought there must be several mysteries in which Champagne has a prominent role. I've come up with four titles. Surely there must be more. 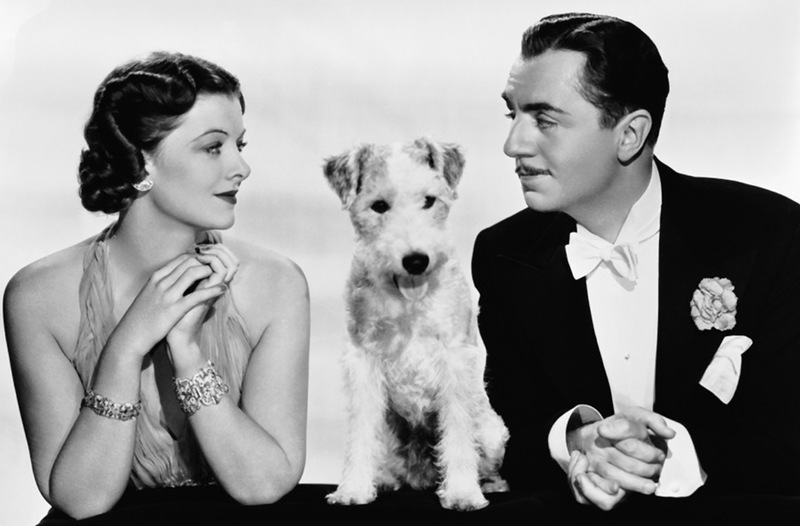 I know that Champagne figures in Dashiell Hammett's Thin Man books. I remember Nick and Nora drinking lots of champagne in the movies. 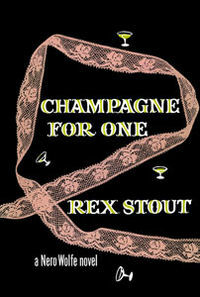 So here's a short list of 'Champagne' books to toast on New Year's Eve. Please comment with any missed titles. 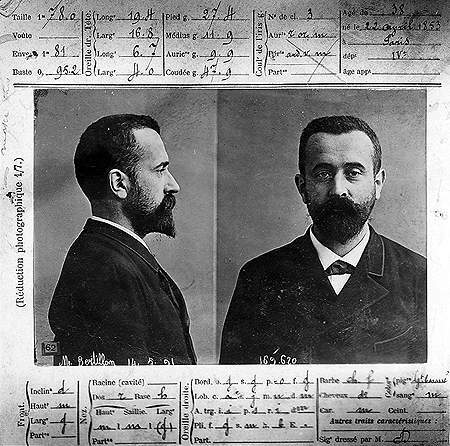 And here's a mystery related story about Champagne, especially for history mystery folks. This was reported in The Daily Mail (UK) July 2010. Talk about a vintage that holds its own! And, then, of course, there's always Sabering Champagne, as opposed to savoring Champagne. Sabering is opening the champagne bottle with a saber. A talent a mystery reader might have! 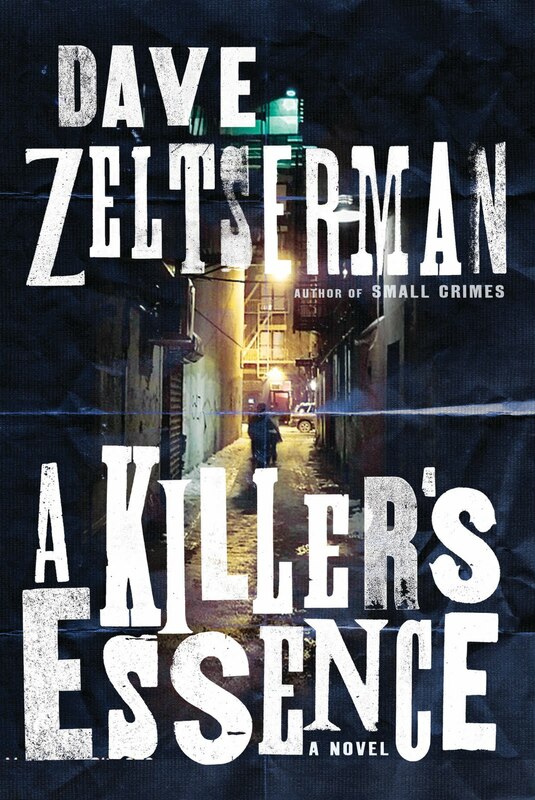 So we've reached the end of the Mystery Author Alphabet Meme today with Z is for Zeltserman. Yes, a few letters are missing, but hopefully some authors in 2012 will feel the necessity to come forward and fill in those letters. So to end 2012 on a high note, here's Z is for Zeltserman: Dave Zeltserman. Dave Zeltserman is a lifelong Red Sox fan, 2010 Shamus Award winner for 'Julius Katz', and the author of 14 novels and numerous short stories. He lives in the Boston-area with his wife, Judy, holds a black belt in Kung Fu, and spends his days writing everything from charming mysteries to pitch-black noir crime fiction, and even some horror now and then. With some luck his books Outsourced and A Killer's Essence will be made into movies in the not-so-distant future. Janet told me I could write about anything, so I’m going to write about the Red Sox, particularly the Sox beating the Yankees in the 2004 ALCS playoffs. If you ask any Red Sox fan who’s been following the team since at least ’78 what their most joyous professional sport moment is, it’s going to be the Sox coming back from the dead to beat the Yankees in ’04. The Sox still had to beat St. Louis to win their first World Series since 1918, but that was all anticlimactic after beating the Yankees. As Sox fans we suffered through Bucky “effing” Dent in ’78, a last second World Series collapse in ’86 (I never blamed Buckner—a lot of stuff went wrong well before the ball went through his legs), and Grady Little leaving Pedro Martinez in the 7th game way too long in the ALCS against the Yankees. So in 2004 we have the Sox down 0-3 against the Yankees. No major league baseball team had ever come back from an 0-3 deficit before, and it’s looking like the Sox are dead, especially with Curt Schilling injured. Game 4 they’re trailing the Yankees 4-3 in the 9nth and the best reliever in the history of the game, Mariano Rivera, is trying to close out the series. A walk, a stolen base, a hit, and the game’s tied, and the Sox go on to beat the evil empire in the 12th in dramatic fashion with a homerun by David Ortiz. The Sox are still trailing the series 3 games to 1 and barely have a pulse but then they take game 5 in equally dramatic fashion winning it in the 14th inning, again a game winning hit by Ortiz. Game 6 is the bloody sock game where they win thanks to Curt Schilling’s heroics. Game 7 is a blowout, and the impossible has happened. The Sox have not only come back from the dead to beat the Yankees, but they’ve beaten the curse of the Bambino at the same time. They end up sweeping the Cardinals in the World Series, and something that Red Sox fans were told would never happen has happened. After 86 years the Sox have won another World Series. So what does all this have to do with crime fiction? Well, nothing really except the Red Sox winning that series was such a cathartic moment for me, as it was for millions of Sox fans, that I decided to place my novel, A Killer’s Essence, mostly during the 2004 ALCS playoff series. Since New York was a better fit for location for my story than Boston, I had my first flash of inspiration where I’d show the Yankees collapse from the point of view of a diehard Yankees fan. A Killer’s Essence is a mix of different genres: a police procedural, a crime novel, a supernaturally tinged horror thriller, but it’s also very much about the chaos and confusion that blinds us in our lives. My main character, Stan Green, is a decent man and a good cop whose personal life is spinning out of control, and having yet one more absolute truth in his life taken away—that the Yankees will always find a way to beat the Red Sox (or as us Sox fan always thought of it, Sox always finding a way to lose)— the eventual demise of his beloved Yankees becomes more nail in his psychological coffin. There are other ways in which I integrate the playoff series into the novel, including giving Stan one more way to disappoint his son. In the end A Killer’s Essence is not only a mélange of all the genres I already mentioned, but redemption for Red Sox fans as well as to a small degree a book about the love of baseball. 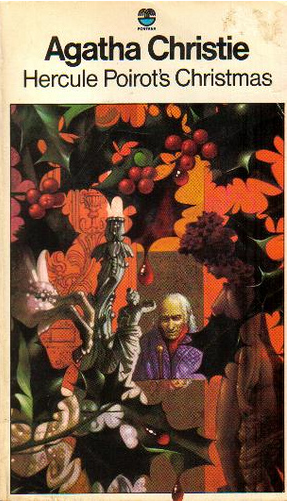 Time again for another holiday list: New Year Mysteries! This is an updated list for 2012! I wish you a safe, healthy and prosperous New Year. May mystery and mayhem only happen in crime fiction! Want some Chocolate with your Mystery? Check out my Chocolate Blog: Dying for Chocolate for Champagne Truffles to make. Rather buy some? Here's a link to a Variety of Champagne Truffles. Later this week I'll post a recipe for New Year's Eve Chocolate Rockets! Cheetah, the chimpanzee who starred alongside Tarzan in the franchise films of the early 1930s, died Saturday. He had experienced kidney failure earlier that week, and was thought to be 80 years old. Cheetah, also known as Cheetah-Mike, acted as Tarzan's comic sidekick "Cheeta" and was one of several chimpanzees who appeared in the films of 1932 to 1934, with Johnny Weissmuller in the starring role. Around 1960, after living on Weissmuller's estate, Cheetah retired to Suncoast Primate Sanctuary in Palm Harbor, Fla.
Read the Rest of the Obit, here. Today the Mystery Author Alphabet Meme continues with W is for Westerson: Jeri Westerson. Jeri Westerson writes the critically acclaimed Crispin Guest Medieval Noir Series. It’s her take on a hardboiled detective series in a medieval setting. Jeri’s books have been shortlisted for a slew of mystery awards including the Macavity, the Bruce Alexander Historical Mystery Award, the Shamus, and RT Reviewer’s Choice Award. She has excerpts of the books at www.JeriWesterson.com. **BOOK CONTEST** Comment below to win a copy Jeri’s latest book, TROUBLED BONES! Winner: Kelly Robinson! When I was a kid, I had a more or less ordinary upbringing but for one thing; in our house, medieval English history was king. We had conversations about the British monarchy at the dinner table. We had books of English literature, history, and historical fiction on our bookshelves. And we had Geoffrey Chaucer. 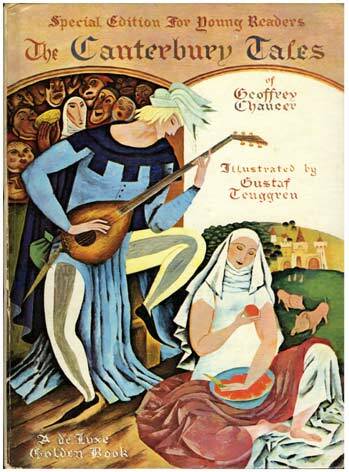 I owned the most wonderful children’s version of the often bawdy book The Canterbury Tales, written sometime around 1387. It is unique in that it was truly the first great piece of literature penned in English. In Chaucer’s day, it was Middle English, a more German/Latinized version of the English we know (ever wonder about all those silent letters in our words? Well, they weren’t silent then). Prior to that, romances and histories were written either in Latin or French. This was now the dawn of Englishness. At this point, even the nobility spoke English, where before, after William the Conqueror came to England and replaced the Anglo-Saxon nobility with his own, the nobility spoke French. Now the lingua franca was English, a change not only in language but of mindset. And it wasn’t just important for that. This showed us a slice of life of everyday folk thinking and speaking like everyday folk. The great romances and histories of the day were about ladies and princes, not the local Miller. In The Canterbury Tales, we get a sense of the real people of the period. The book that I had growing up was the Deluxe Golden Book “Special Edition for Young Readers” illustrated by Gustaf Tenggren. Oh, these were wonderful illustrations. As strange and as foreign as Middle English itself. I was drawn in by the whole package of weird and wonderful pictures and then these stories. All of these different medieval people were meeting in London to journey to Canterbury and they would each tell stories to pass the time. Stories of people like them, or great timeless stories from Ancient Greece or old Britain. The person who told the best story would win a dinner back at the Tabard, a tavern where their journey began, a tavern that really existed back in fourteenth century London. And I knew these stories well. The Aesop-like Nun’s Priest tale of Chanticleer, the Wife of Bath’s tale of the Loathly Lady, the Canon’s Yeoman’s tale of the false Alchemist. I enjoyed them all. I was bitterly disappointed when I got to the end to discover that Chaucer never finished his tales. He died before he could. Who would have won? And what were the other stories to be told because they had to make the journey back to London? To this ten year old, it was a complete bummer. But that wasn’t the extent of my partnership with Chaucer. My mother had a record of an actor reciting some of the stories in Middle English. How I listened to that! What was it? It was sort of English but not really. And it had a lyrical cadence to it like a romance language. I knew before I was old enough to ask that what I was hearing was something odd and special. And then there was that one degree of separation from Chaucer himself. We made frequent trips to the Huntington Library in San Marino, California. This was a museum of books and manuscripts, with a gallery of a collection of Gainsborough paintings, including Blue Boy and Pinkie, and extensive gardens and grounds. When I was a kid it was free. Our parents went to lots of places that were free since we were a family of five with little to no money to throw around. In the Huntington Library, they have quartos of Shakespeare plays, a Gutenberg Bible, and the Ellsmere Manuscript. The last is the beautifully detailed handwritten and illustrated manuscript of The Canterbury Tales, commissioned not too long after Chaucer died in the early fifteenth century. It is on parchment and done in careful calligraphy, complete with drawings of all the pilgrims, including Chaucer himself. I was intrigued again, now because of the floral designs and calligraphy that was to inspire a later career as a graphic designer. I couldn’t escape the fellow and he followed me into adulthood where I could read all the stories, including the ribald ones, with a deeper appreciation for what the whole thing truly was. Not just classical stories retold, but of moral lessons through the persons of the pilgrims themselves. Much later, when I created my medieval mystery series with a sleuth who was a hardboiled detective, I made him a disgraced knight who used to move in the more noble circles, including the household of John of Gaunt, the duke of Lancaster. Why did I pick the time period of Richard II’s reign? Chaucer’s fault again. Because I knew I wanted to include him at some point in the series. And of course he will have known Crispin and been his friend, since he, too, lived in Lancaster’s household. 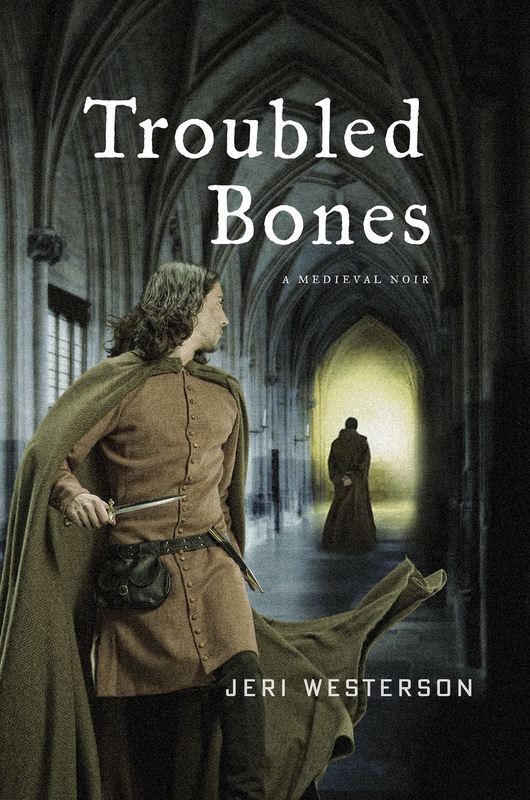 So what better way to introduce him in the series than by reliving The Canterbury Tales and forcing Crispin to journey to Canterbury and meet some very familiar pilgrims in the fourth installment, TROUBLED BONES. Only this time it involves murder. And then, of course, Crispin has to get his friend Chaucer out of trouble. How much trouble? I suppose you’ll have to go on the journey to Canterbury along with them to find out. HAPPY CHRISTMAS TO ALL! 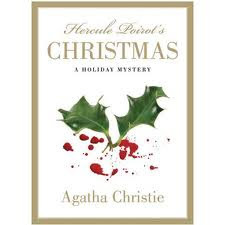 And, since we know longer have a Christie for Christmas from the Queen of Crime, Agatha Christie, I thought I'd share these covers for Hercule Poirot's Christmas! Be sure and check out last year's Christie for Christmas Post: Agatha Christie's The Adventure of the Christmas Pudding, complete with a recipe for Christmas Pudding, sans poison! The end of the list and none too soon. Only 3 more days 'til Christmas. Woo... 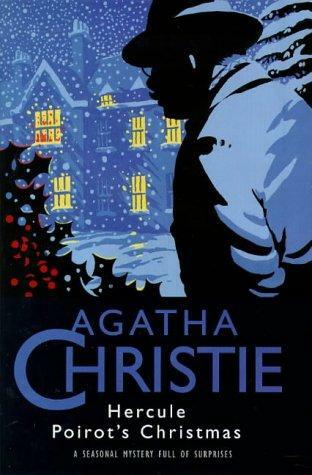 Here are the final authors who set their mysteries during Christmas. S-Z. Happy Holidays! 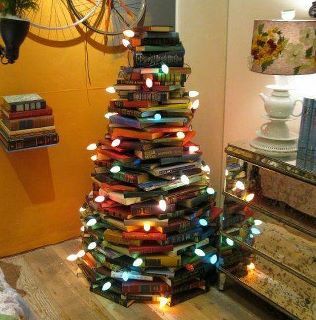 Be sure and check out Christmas Crime Authors A-D, Authors E-H, Authors I-N and Authors O-R. As always, let me know if I've forgotten an author and title. Have a great holiday! 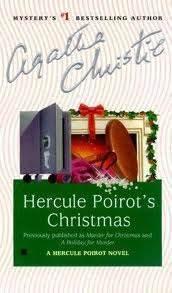 Here's the list of Christmas Mysteries, Authors O-R. Hope you're having fun with the titles and authors. Let me know if I've forgotten any! Be sure and check out Christmas Crime Authors A-D, Authors E-H and Authors I-N.
Chanukah (Hanukah) begins tonight, December 20 and is celebrated for eight days--through December 28. 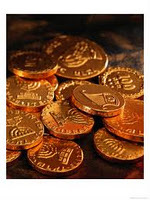 Yes, Eight Days of Chanukah! Jewish Holidays are aligned with the lunar calendar, so they vary every year. That will give you enough time to read all of these titles! Let me know if I've missed any. "The Worse Noel" by Barb Goffman in The Gift of Murder. "Navidad" by Elizabeth Zelvin, EQMM, January 2011. Guest blogger Randal S. Brandt is a librarian at The Bancroft Library, University of California, Berkeley, and the creator of two critically-acclaimed websites: Golden Gate Mysteries, an annotated bibliography of crime fiction set in the San Francisco Bay Area, and A David Dodge Companion, chronicling the life and works of mystery/thriller writer David Dodge (1910-1974). 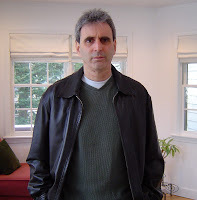 He has recently written the introductions to new editions of Dodge’s Death and Taxes (July, 2010), To Catch a Thief (October, 2010), and The Long Escape (December, 2011). Randal Brandt will be a guest at a Mystery Readers NorCal Literary Salon in the New Year. 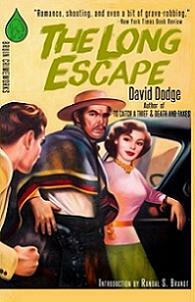 David Dodge’s fifth mystery, THE LONG ESCAPE, originally published in 1948, has been reissued by Bruin Books and is now available in a handsome new edition. After four novels starring San Francisco tax expert James “Whit” Whitney, written while Dodge was working as a C.P.A. in San Francisco, this book marks the first adventure of Dodge’s second series character, expatriate private detective Al Colby. By the time THE LONG ESCAPE was written, Dodge had relocated to Guatemala City, so it is only natural that Colby walks the mean streets of Latin America, operating out of Mexico City. The story begins when Colby is hired by a Los Angeles attorney to find one Robert R. Parker, who deserted his wife and $250,000 worth of property in Pasadena five years before. The wife doesn’t want him back; she just wants clear title to the property. 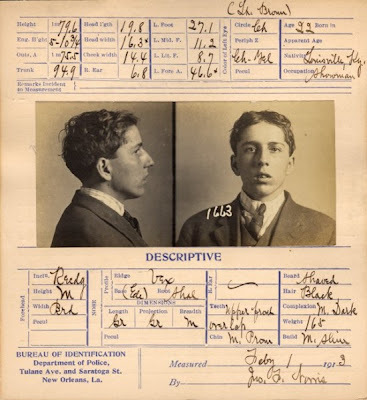 Colby’s job is to find him and either prove him dead or persuade him to contact the attorney in order to sign the necessary documents transferring the property. The attorney had been able to trace Parker to Mexico City. Colby picks up the trail and follows it through Central America to Santiago, Chile. This book holds a very special place for me. Not only was it the first Dodge novel I ever read, but the story of the circumstances surrounding my discovery of it is one that I’m sure Dodge would have appreciated. In 1994, my wife and I went on a vacation to Mexico City. One travel habit we share is to take along novels to read that are set in the locales we are visiting. For this trip my wife had taken along a tattered paperback she had picked up years before in a thrift store. The book, a 1950s Dell mystery “mapback,” featured a colorful map of Mexico and South America on the back cover, promised “A man hunt (girls included) from California to Chile,” and featured Al Colby, a Mexico City private eye. Perfect. One morning I awoke feeling under the weather, as it were. Although we had been very careful, it turns out that even the most vigilant of norteamericanos can succumb to la turista. And it was raining. We decided to forego our sightseeing plans and spend the day resting and relaxing in our hotel room. To pass the time, my wife, whose digestion was untouched, got out her paperback, The Long Escape, by David Dodge. She kindly offered to read it aloud, giving me what I thought would be an excellent opportunity to sleep it off. Several hours later I still had not slept a minute, but not because of la turista. She had read that book aloud, cover to cover in one sitting. When we finally closed the book I was feeling much improved, and my wife and I had a new author to pursue and, apparently, a new cure for the Aztec Two-Step. Señora Molly Jean Mendoza lived in a pretty good apartment house out toward Lomas de Chapultepec. A frowsy maid let me in without asking my name or business, then went to call the señora while I parked my hat on a pile of American movie magazines. Molly Jean turned out to be a rubia, a brassy blonde of the type a lot of Mexicans go nuts about. She was any age you want to guess, with a sulky mouth. She greeted strange gentlemen visitors in a form-fitting housecoat with a zipper running from neck to hem in front that practically said Pull me, kid. The handle of the zipper was a little bell that tinkled when she walked. 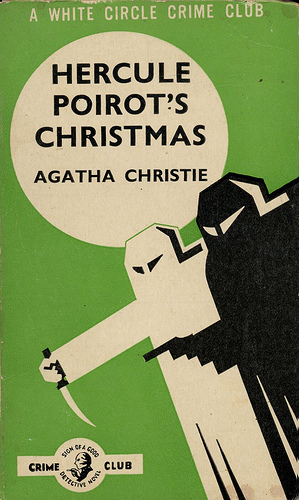 Here's the Third installment of Crime for the Holidays: Christmas Crime Fiction Authors I-N. What a long list. Makes for more reading which is always fine with me! 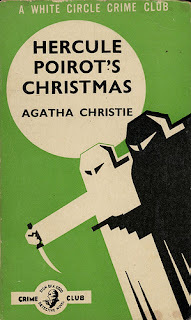 Be sure and go back on Mystery Fanfare for Christmas Crime Authors A-D and Authors E-H. Let me know if I've forgotten any. Another Ripped from the Headlines. Truth is Stranger than Fiction. Nancy Gelber, Crime Writer, Arrested for Botched Murder for Hire Plot. I don't think she was doing research! According to the author blurb on her novel Temporary Amnesia by Nance J. Mancuso (Rosedog Press), "Writing had been laid aside since high school when an English teacher saw promise in a rather outlandish, for those times, short story. In her 30's, Nancy rekindled her passion for writing when she created an X-Files screenplay. Stories seemed to flow onto the computer screen after that. Her other interests include aquatics, ocean fishing, playing cards, and any place that has a roulette wheel." They forgot to mention hiring someone to kill her husband. From the article by David Lohr in the Huffington Post. Police in Texas have arrested a published crime writer who allegedly tried to hire a hit man to kill her husband. 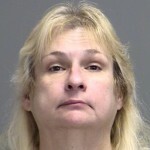 Nancy Mancuso Gelber, 53, has been charged with solicitation to commit capital murder. Gelber is being held at the Brazos County Jail on $75,000 bond. "It's crazy. It's crazy to hear. I'm kind of speechless," Gelber's close friend, Brandi Pointer-Castillo, told The Huffington Post. According to the Brazos County Sheriff's Office, investigators received a tip last week indicating that Gelber was trying to find a hit man to harm her estranged husband, 54-year-old Joseph Richard Gelber, Jr. Prior to her split with her husband, Gelber had her sights set on becoming a career writer. Her first novel, Temporary Amnesia, was published in August 2010. The 362-page book –- dubbed a "crime thriller" -- is a fictional story about a man who breaks out of prison and uses a team of prostitutes to pull off several brazen bank robberies. "Along with suspense and terror, this crime-thriller has a touch of levity and romance," reads the book description on Amazon.com. 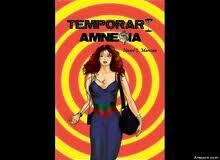 "Temporary Amnesia will blow your mind! At times, you may even find yourself siding with the bad guys!" Read the rest of the article by David Lohr HERE. Want to read the novel? I don't, but if you do, I found it on GoogleBooks. 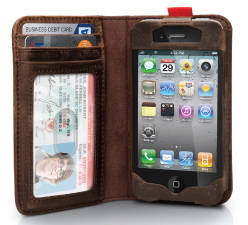 Now you can combine your wallet and IPhone in one BookBook made exclusively for iPhone 4 and iPhone 4S. This little book has a convenient ID window and slots for your debit/credit cards, reward cards and cash. Protect your iPhone between two hard-back covers. Fold the covers back-to-back to talk. BookBook allows edge-to-edge iPhone access. You can access all iPhone controls and ports with BookBook. Charge, sync and use the headphone jack while your iPhone is safe and sound in its phone book. Yes, it’s also a Quick Book. 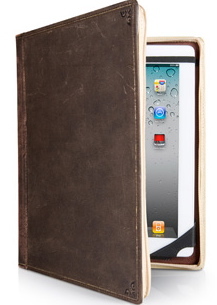 The BookBook Case for iPad 2 is a handmade one-of-a-kind, hardback leather case that doubles as a fully adjustable stand. Along with its vintage looks, this case makes iPad feel as if you’re holding a 'real' book, and in many ways you are holding a book. BookBook for iPad. Hand distressed covers mean no two look alike. BookBook for iPad is available in two styles: dark brown cover with black beneath 'BookBook' on the spine (Classic Black) and a more vibrant brown cover with red behind 'BookBook' on the spine (Vibrant Red). Sad News indeed. Russell Hoban, died last night at age 86. Legendary cult author Russell Hoban, whose apocalyptic novel Riddley Walker was described by Anthony Burgess as "what literature is meant to be", died last night aged 86, his publisher has announced. Hoban, born in Philadelphia, moved to London in 1969. He first made a name for himself with his children's books; his series about Frances the badger and his novel The Mouse and His Child are acclaimed as modern classics. Riddley Walker, set in Kent 2,000 years after a nuclear holocaust and told in a distinctive version of English, was begun in 1974 and published in 1980 to huge praise. It has since been included in Harold Bloom's survey of literature, The Western Canon. Hoban joined the US army aged 18, and was posted to Italy during the second world war, where he served as a messenger, later awarded a Bronze Star for bravery in action. My father was serving on the front lines there as a doctor, and that's where they met for the first time. With extended family in common, a friendship ensued. Hoban was the brother of world renown photographer and children's book author, Tana Hoban. Russell Hoban worked as a freelance illustrator on his return to America, publishing his first book, the illustrated children's title What Does it Do and How Does it Work, in 1959. As well as writing (and sometimes illustrating) more than 20 books for adults and children, Hoban's novel Turtle Diary was filmed with a Harold Pinter screenplay, and he also wrote the libretto to Harrison Birtwistle's opera The Second Mrs Kong. In an interview with the Guardian in 2002, Hoban described himself as "simply an addict" to writing. "If I am kept away from writing I become physically unwell. It is art and the creation of art that sustains me. Things like Conrad's Nostromo or Schubert's Winterreise or Haydn's Creation or paintings by Daumier make me feel it is a good thing to be part of the human race," he said. "It gives me energy, and now I've got into this rhythm where Angelica's Grotto was followed by Amaryllis and then The Bat Tattoo. I don't want to miss a year. And besides, when the tank is getting empty I think you drive a little faster." "It's very, very sad indeed," said Bill Swainson, Hoban's publisher at Bloomsbury. 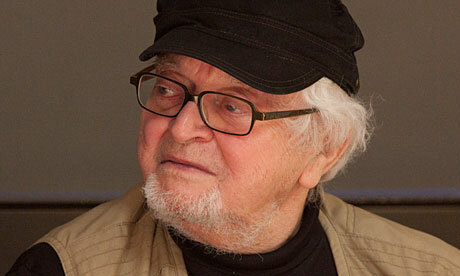 He described Hoban as a "shocking, funny and really imaginative" writer. "Like most people I came across Russell through Riddley Walker, which woke me up to what he was doing," he said. "His wonderful imagination is a common thread in all his books. In his last, Angelica Lost and Found, a hippogriff escapes from a painting and lands in San Francisco outside the window of a Jewish gallery owner who has just dumped her lover. Russell always wrote with with such a light touch - he always had fun, and made you think that there's not a sentence wasted." Death, Hoban predicted in 2002, would "be a good career move". "People will say, 'yes, Hoban, he seems an interesting writer, let's look at him again'," he said. Last Spring I posted news of a new Perfume from Designer Karl Lagerfeld: Paper Passion. What I liked about it was the packaging. It is sold in a hollowed out hardcover book (hopefully damaged or ones made specifically for this). 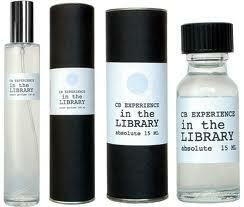 I mentioned Christopher Brosius' I Hate Perfume Line. His In the Library perfume supposedly evokes books smelling of Moroccan leather bindings, cloth, rare novels and many others. This is perfect for every book lover.. Spray your iPad? As long as they don't contain the killer mold of old books, I'm good with this! Here's an interview interview with Christopher Brosius in BookRiot. Today, I continue the Christmas Mystery list. It's amazing how many mysteries are set during the holidays, but it's such a stressful time, I shouldn't be all that surprised. Fennelly, Tony. Home Dead for Christmas. Greenberg, Martin H. (ed) Cat Crimes for the Holidays, Holmes for the Holidays, Santa Clues, More Holmes for the Holidays. 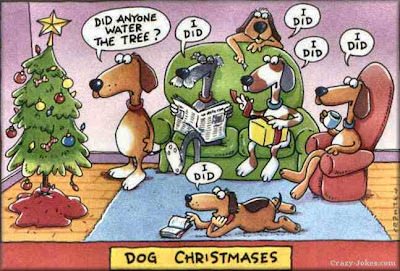 Twelve Crimes of Christmas. Coming soon: the rest of the alphabet :-) For Authors A-D, go HERE. Hat Tip to GM Maillet for this news. 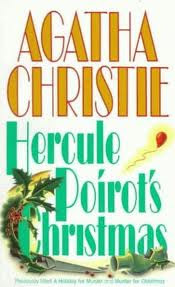 ITV has commissioned Five new Poirot films for production in 2012! 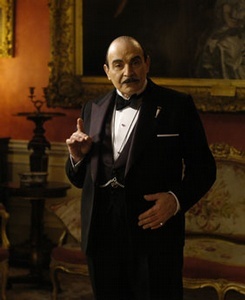 David Suchet will return to his role as Hercule Poirot, the fastidious and brilliant Belgian detective. 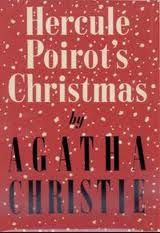 The films, based on the Agatha Christie Poirot novels and short stories yet to be filmed, have been commissioned from ITV Studios and Agatha Christie Ltd.
Labours of Hercules; Dead Man's Folly; The Big Four; Elephants Can Remember; Curtain. So Creative! 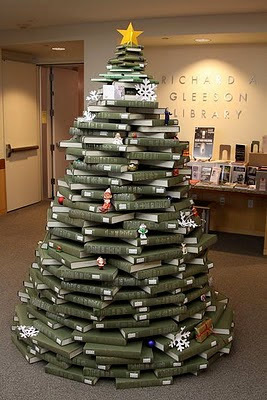 This first photo of a Bookish Christmas Tree was at an Anthropologie Store in Rochester, NY. Photo by Patti at Pandora's Box. Here's a round-up of some of my favorites. 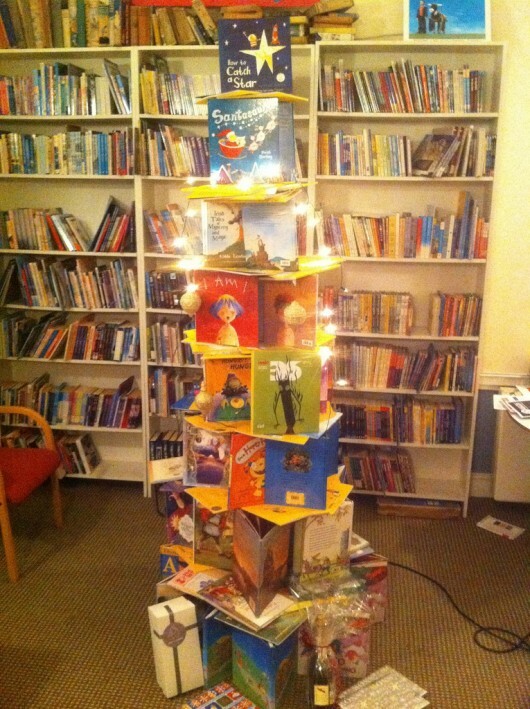 Are you doing a Book Tree this year? Send a link. Check out Last Year's Library Christmas Tree! Flavorwire is one of my favorite sites. So much great wacky and different information. As a mystery reader, I was fascinated by the December 1 article and photos "What Did the World’s First Mug Shots Look Like?" Crime readers and writers will both like this. 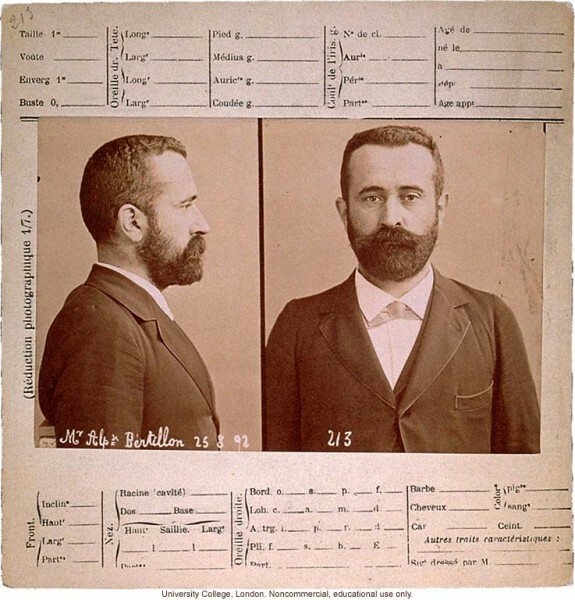 "The mug shot has, by now, become so universal that it’s hard to imagine a criminal justice system without it. 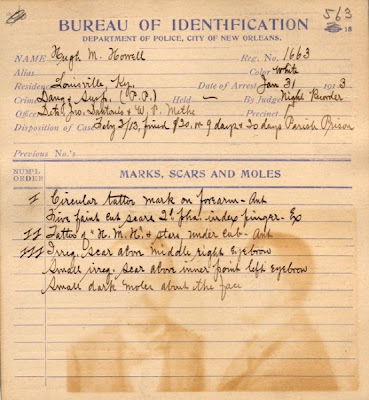 But in the mid-19th century, when photography was still a new medium, there was no standardized record-keeping system in place to help police departments identify repeat criminals. 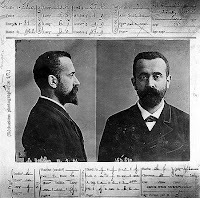 Random daguerreotypes and loose photographs laying around unfiled weren’t cutting it — which is why in the early 1880s, French criminologist Alphonse Bertillon introduced the Paris police force to a standardized method that documented mug shots, body measurements, and in some cases, early finger prints." These may not be action fictions, but they sure are fun. 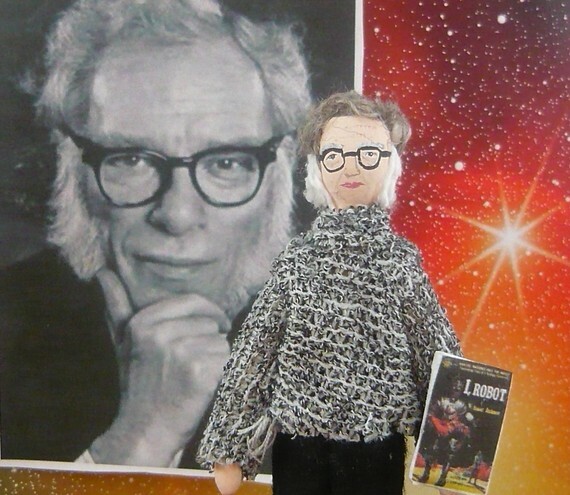 Librarian Patti O'Brien found this link to FlavorWire that links to Uneek Doll Designs. 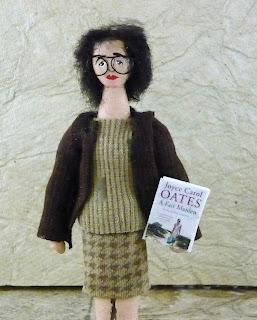 Check out these great handmade dolls by UneekDollDesigns of your Favorite Authors. There's a link to Literary Characters and more! For sale on Etsy. Don't miss Agatha Christie Doll. 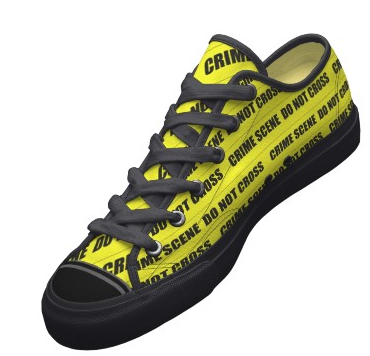 In one of my "other" lives, I use a lot of crime scene tape. 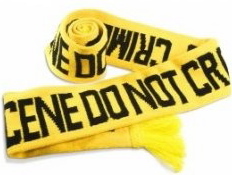 It's readily available, and you don't have to be a crime scene investigator. Here's a great ensemble for the holidays!